UK Nepali community support meeting with senior regional (Dorset, Hampshire, Wiltshire, Isle of Wight [DHWI]) Depart of Work & Pensions [DWP] Jobcentre Plus [JCP] leads. This nationally important Nepali community empowering meeting was held on 2nd August at DWP Aldershot. On our Nepali community side were Major Damar Ghale (a senior greatly respected UK Nepali community figure and a Chief Patron of the NRNA-UK) and UKNFS [UK Nepal Friendship Society] Chief Executive Officer, Alan Mercel-Sanca. The context for the meeting was a recent major ‘eleventh hour’ development with the UK Nepali community, UKNFS facilitated, national UK Nepali community advice access project. A final call had been made to the remaining few national/regional/local organisations & agencies that had been contacted to involve in the project (involvement meaning completing a questionnaire), but despite follow-ups from our Nepali community side, had not until that time involved or acknowledged the contacts that had been made for project involvement. A number kindly contacted back (including Hampshire Futures [Hampshire Adult Learning), amongst which were, of particular importance, regional DWP and also national-level DWP. The UKNFS would like to thank Karen Taylor (District Operations Manager Wiltshire, Swindon and North Hampshire) and her colleagues, Jill, Hazel, and Dorothy for the seriousness and quality of their enthusiastic readiness to engage in meaningful/credible ways directly with the UK Nepali community in their area-location of operation, at both community and policy and strategy development levels, through this meeting with Major Ghale and Mr Alan Mercel-Sanca. 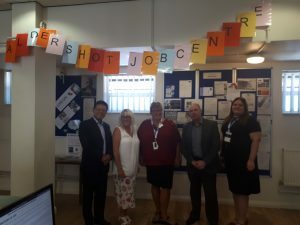 More details to follow soon, including on the UK Nepali community leads UKNFS facilitated engagement with the Census, Office of the National Statistician that Major Ghale is also kindly enabling in Aldershot for the 22nd August.